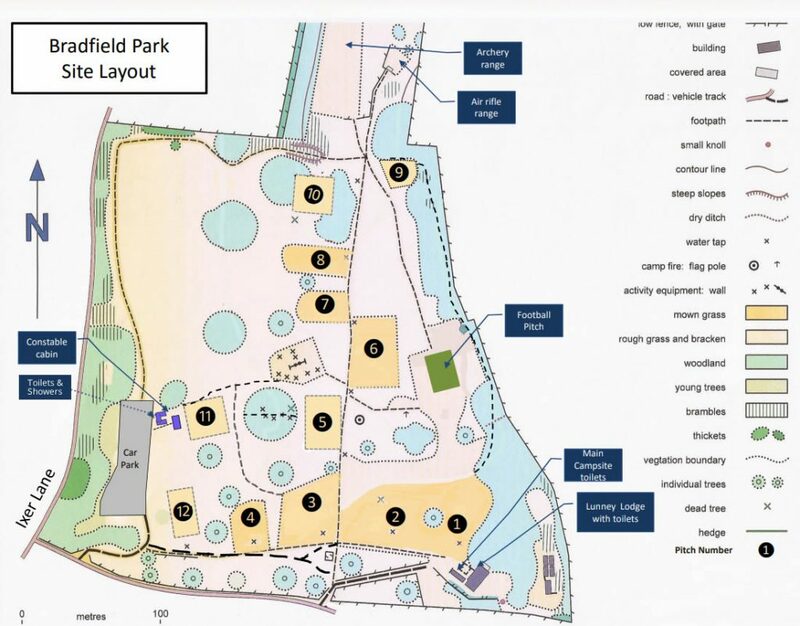 Camping at Bradfield Park Campsite is suitable for Scouts, Guides and other youth organisations such as D of E, Air Cadets, Boys Brigade etc. Currently we have twelve separate pitches of varying sizes. Cooking is by your own gas or alter fires, which are available on site. Wood is normally available around the site. Water taps are close at hand throughout the site. The campsite toilets/showers are situated next to Lunney Lodge and Constable Cabin. This is suitable for sleeping approx. 18 people in bunk beds. This contains a hall, kitchen, 4 bedrooms and toilets/showers. The kitchen if fully fitted with crockery, cutlery, cooking utensils, fridge-freezer, oven. Chairs and tables are in the hall. The three main bedrooms contain bunk beds. Electricity is included except for heating which is is operated by £1 coin meter. This contains a hall, kitchen and toilet/shower. There is no sleeping accommodation. The hall is fitted with tables and chairs. The kitchen is fitted with oven, fridge-freezer, water boiler. Groups need to bring their own cooking utensils, crockery, cutlery etc. Electricity and heating is included in the cost.